Question: Where is the best, most fun place in Canada to spend March Break for any combination of kids, parents and assorted family members? Niagara Falls, of course, and you’ll need a place to call home while you’re here. Check out the Holiday Inn By The Falls, which bills itself as the best-located hotel in Niagara Falls. It’s hard to argue with that claim – the hotel, on Murray Street, basically sits right at the top of the Horseshoe Falls. Walk down the hill, or for a couple of bucks ride the Incline Railway, and you’re there in a matter of minutes. The Holiday Inn By The Falls is a good place to wind down from your day on the town, too. It’s a family-friendly place that offers an indoor pool, fitness centre and great meals and relaxation at Coco’s Pizza Bar and Grill or the Fallsview Terrace Patio and Tiki Bar. You’re also right next door to the Niagara Fallsview Casino. In addition to a round-the-clock chance to win enough to pay for your holiday, the wildly popular stage musical We Will Rock You, based on the music of Freddie Mercury and Queen, plays at the casino’s Avalon Ballroom nightly from March 7 to 17. Nearby on Stanley Avenue, there’s a big show for the kids – on March 9, Mini Pop Kids Live! plays at the Scotiabank Convention Centre. And here’s something you might not even have to leave your hotel room to enjoy. The falls, both the Horseshoe and American, are stunning sights to behold any time, day or night, winter or summer. They take on an extra special light, so to speak, at night though when they are illuminated in every colour of the rainbow. It’s pretty spectacular, and from March 1 to 11 they will be lit from 5:30 p.m. to 1 a.m. For the rest of the month, lights go on at 6:30 p.m. While you stay at the Holiday Inn, you are a guest in the Fallsview tourism area, one of the hottest of the city’s hot spots. Nearby there is a Yuk Yuk’s for those who love to laugh, as well as the exciting attractions grouped near the falls, like Niagara’s Fury, Journey Behind the Falls and the Floral Showhouse horticultural exhibit. Hop on one of the WeGo tourist buses that pass right by, and you’ll be transported all over the city but especially to all the best spots to visit. You’re just a short bus ride from historic Clifton Hill, for example, otherwise known as the Street Of Fun. It offers everything from a giant arcade to a multi-storey outdoor go-kart track, a giant Ferris wheel, one of Canada’s biggest indoor waterparks and more restaurants than you can shake a pork chop at. 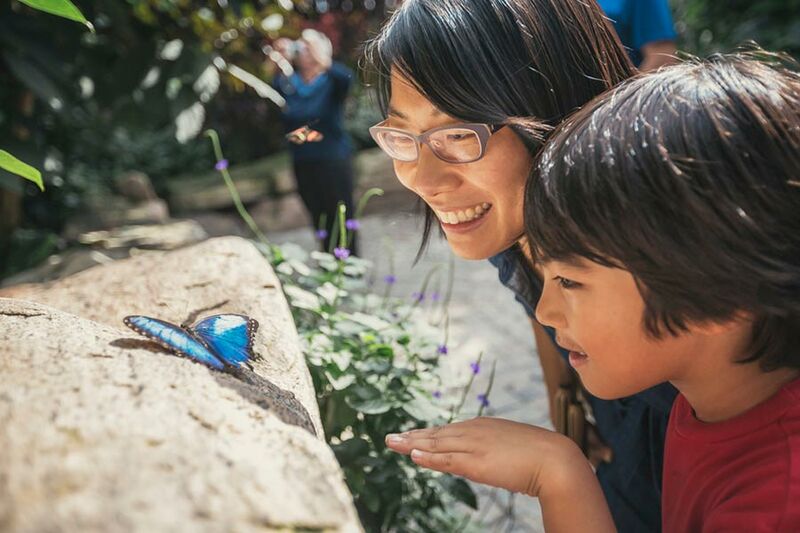 A little further down the Niagara Parkway – but still on the WeGo route – is the Butterfly Conservatory and its beautiful, pint-sized flying residents housed in a lush, tropical setting that might be a warm relief from this cold winter. During March Break it is hosting Wild Ontario, a live display of some of the wildlife that is native to the province’s forests and marshes. You’ll meet a skunk, porcupine, wood turtle, lots of snakes and a barn owl. Bet they don’t have those close to the neighbourhood you live in. Closer to your Holiday Inn home, why not drop in to the Skylon Tower and take a ride to the top. You don’t get to visit Niagara Falls every day, and the view from way up top is a memory you’ll take home and keep forever.